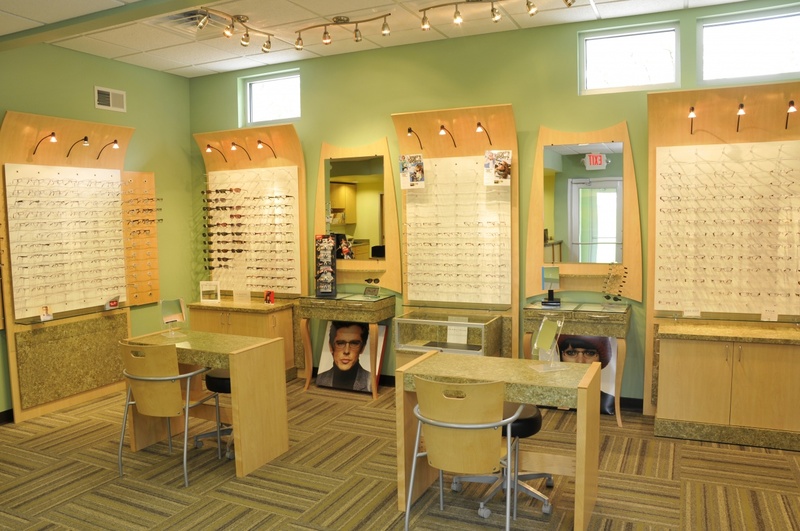 Husband and wife optometrists Dr. Steven Samuelson and Dr. Lauren Ta purchased a practice and the building it was housed within in 1998. Having grown the practice significantly since that time, they were running out of space. Moving records to the basement and purchasing new technology had helped, but they thought an addition would need to be constructed at the rear of the building to really solve the problem. National Construction was their first call, because the commercial contractor’s sister division had built their home, and they trusted the quality of the process and end result. After examining the foundation, National recommended the purchase and renovation of a new building instead. The doctors wanted to remain located on the main street of Mount Horeb and desired a street-level entrance and ample storage space. They also wanted to avoid the parking challenges of their current downtown location with a dedicated parking lot that would accommodate continued growth. National recommended the purchase of a Frank Lloyd Wright inspired building at the far end of Main Street. Built in 1956, the single-story stone and redwood structure had previously been owned by the local Jehovah’s Witnesses congregation and a tax and accounting business. Limited maintenance had been done over the years. National Construction discovered leaks in the entire perimeter of wood walls, and the basement had moisture and mildew issues. A concrete and stone stage would need to be demolished, as well as all interior finishes. An outdated planter was removed from the front of the building, and 250 square feet of sidewalk was added from the parking lot to the new entry. National restored the existing stone clad wall, painted the existing roof beams and repaired roof leaks. All windows were replaced with thermally improved anodized aluminum models. All interior walls were removed and replaced. To remedy the leaks in the wood walls, National jacked them up and replaced what was rotten with treated wood. An in-house architect designed a new, functional floor plan that included a relocated entry and reception space with a children’s play area, a dispensary, office space with room for records storage, doctors’ offices, a pre-test room, four exam rooms, a contact lens training area, bathrooms, and optical and visual field rooms. Dr. Ta’s modern taste inspired the design and materials; her love of green was incorporated in the paint color and carpet. Only half of the existing building had a basement, so National dug out the remaining portion to double the square footage, and resolved the mold and mildew issues. The 2,250 square foot clinic in an accessible, central location has allowed Dr. Samuelson and Dr. Ta to continue to grow their practice and consider adding partners in the future. "This project came about because our residential sister division built the business owners’ home. We were grateful for the opportunity, and thrilled to see our complete construction solution business model serve the client successfully." "We still love walking into our office each day. You know you picked the right people to work with when you still get that feeling after many years. Jeff and his team are very easy to work with. They take the stress out of building. They worked around our busy schedules for meetings. They brought samples for us to look at. They understood what we meant when we described things using non-technical terms. If we had to build again, we would choose National."